Crew Task Chair(tm) by Turnstone (TSCREWBUZZ) at Pure Design / Seating / Workspace ::: Furniture for the Home, Office, Home Office, and More at Pure Design Online! 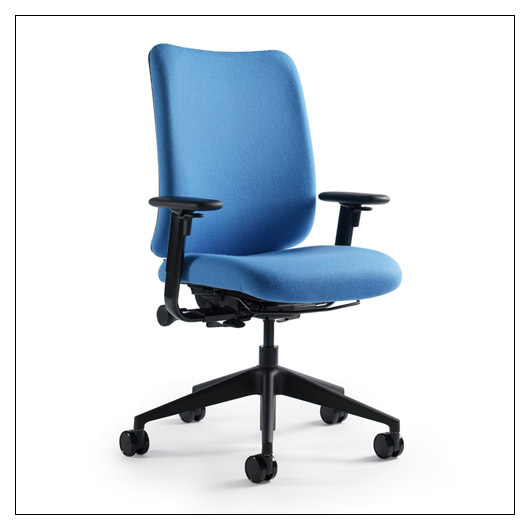 Crew is Steelcase/Turnstone's premier desk chair, designed to deliver all-day comfort and a high level of performance with simple, intuitive adjustments right at your fingertips. Its' simple, user-centered adjustments teamed with a classic, timeless design set it apart from at this price point. Designed by San Francisco based Brian Kane, every detail is cohesive and works together to create a tailored aesthetic. The design details are evident at first glance; the angular base, the streamlined arms ... this chair is a great addition to any space. Crew is deceptively simple looking yet highly refined in both function and aesthetics. Soft casters (for hard floors) can be substituted for no additional cost. Ordering the aluminum base incurs an additional charge, however. Plastic, aluminum, nylon, urethane foam, polyester fabric. This version of the Crew comes with height- and width-adjustable T-arms and hard casters. Please allow an additional 2 weeks to ship. This item can only be shipped to street addresses in the contiguous 48 United States.